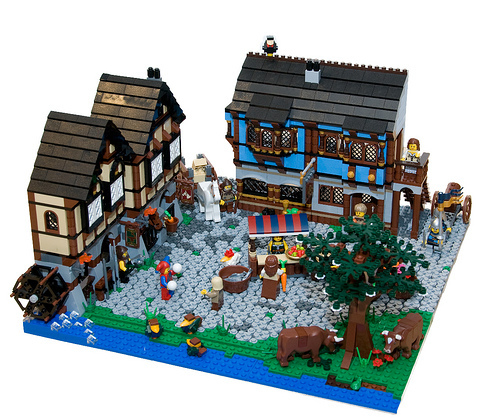 Huw Millington expands his 10193 Medieval Market Village set to include a full town square layout. The construction isn’t overly complex, but the effect is gorgeous. You can build your own with a baseplate and some additional plates to simulate the water, grass, and paved stones. Everything else is included in the set! bowerstone market from fable 2 anyone? Loved how the transparent cheese pieces make the churning water effect around the watermill. ^ I suspect that’s an addition from the Castle Advent Calendar. Good, because I had a bit of a panic when I read “everything else” was in the set. That’s great! I love the cows around the tree! @ Sarah – There are also a couple extra ducks, some extra food, another horse, and an extra fig or two that don’t come in the set. It’s odd then that it’s also one of my most basic, a baseplate with 3 layers of plates on top. However it does look very effective and brings out the best of what is already an excellent set. Josh & Andrew are right, there are a few extra bits from the Advent calendar and elsewhere but 95% of it is out of the 10193 box. It looks great! could you please post more pics on your flickr profile? thanks!